Rani Mukerjee’s hands are not like the hands of a typical hand of a film star. Her hands show a personality with a love of order, punctuality, security, and also a sensible and practical attitude in most things. It is because of this down-to-earth attitude that she is able to keep her ego in the backseat. It's not as if she doesn’t have an ego, because she does. It's just that she is too practical to let it interfere with her work. The main features of her hand are her broad, large palm, short fingers with knots and squarish tips, developed mounts, particularly Jupiter. What makes these features significant is that these signs are fairly pronounced. Her lines are visible only faintly (from the photos) but a long stable headline can be seen. The headline and strong thumb combined add to her qualities of common sense and reveal her intelligence, capability and organizational abilities. seen on her hand, but she has control as well (headline and thumb) and also the ability to remain calm under pressure. So when she does show her temper, it is consciously done. What annoys her is underhandedness or carelessness. And it is not as if she expects too much from others, not at all. She is a pragmatic soul, and reasonably tolerant. Check out a hand photograph here. 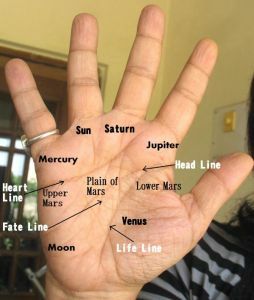 Rani’s hands show extraordinary talent (Apollo, Moon, Headline, Mercury) more so than I have seen on any Bollywood hand until now with the exception of Aamir Khan, Amitabh Bachchan and to some extent Shah Rukh Khan. This makes me wonder why Rani has not been more successful or hasn’t done more meaningful movies like "Black". It is a pity that Rani’s potential has not been fully exploited by directors. Ego, pride and ambition are part of her persona. She tends to be a little domineering, not too much as she is a sensible woman. She has a melancholy and moody side to her personality. She is good-hearted and helpful (Heartline, Venus). She is also unselfish, straightforward, and a reasonable person. Or check out the hand analysis of other Bollywood actors and also actors from Hollywood. Rani Mukherjee is not seen much these days in films. I was never a fan of hers, but I agree that she is a very talented lady. Interesting to know about her practical nature. TN, I think that Bollywood films are not very kind to the leading ladies. Rani is on her way out now, I think. I too have a positive opinion about her acting. But the extraordinary talent part did surprise me quite a bit. DI, I think she hasn't got the kind of films that would showcase her acting skills. Sometimes, looks do get in the way of a successful acting career. Whenever I think of Rani, I can see her smile. She's smiling in all her movies for the most part. In such cases, it's hard to break this pattern and show any versatality,however hard one may try.I think that's the case with Rani. I guess she does smile a lot. I think that is the kind of roles she gets, the simpering, looking pretty, flirty kinds. that's the kind of roles most women get in bollywood films. she has a bad choice of movies I think. I too do not see any versatility in her roles. but that is the roles, not her. she is capable of a lot more.